After a few customers reported compatibility issues with the E-M1 we immediate got our hands on one to study. After numerous attempts tweaking the hot shoe of the V6 II, we found out what was causing a hot shoe connection problem was simply the hot shoe metal spring on the E-M1. With a pair of tweeers or a toothpick we carefully slide out the metal spring and mount the V6 II on the E-M1 and immediately the V6 II was able to auto-detect it as an Olympus camera and we were able to shoot in HSS modes without any problem. We suspect the metal spring on the E-M1 is slightly thicker than its silbings which pushed the contact pins of the V6 II upward and away from the camera's, even it's only a little bit but it already prevented the pins from making contact. Besides the metal spring itself, we notice the E-M1 has a second layer of plate place above the actual contact surface beside the pins. 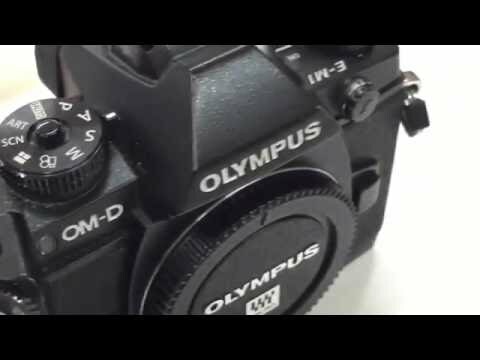 Olympus E-M1 users may use this simple method if you experience connection issues with the V6 II mounted on the camera. Please feel free to comment and share your experience of the V6 II on the E-M1. After removing the spring on my E-M1 the V6 II started working. Unfortunately the locking pin on the hot shoe of the V6 doesn't align with the hole on the em1, and without the spring you are more vulnerable to having the V6 and any mounted flash falling off. I think that if one filed off the 0.5mm protrusion in the middle of the leading edge of the V6 hot shoe the pin would engage with the camera body. Will try it when I get back home in ten days and update this post with the result. You have a similar problem with an Olympus FL-600R flash. The solution is simpler - insert the flash into the V6 hot shoe mount and then pull back 0.5mm to allow the locking pin on the flash to engage. Yes the locking pin on the V6 / V6 II is tailored for Canikon and may not fit other manufacturers, unfortunately. Thanks @Michael and we look forward to your findings. Same problem for the panasonic?? I just had some problems with the ttl today. Possibly. It really depends on the model. So far the E-M1 is the only Olympus camera that requires the removal of the hot shoe metal spring. And not even all the copies of E-M1. Which Panasonic camera are you using? Are you having problem with TTL Pass Through? I've tried everything and still does not work TTL, EM1 and Canon 580 EXII ( and 430 EX II). I remove the plate and does not work the TTL. Upgrade the firmware and not work. I clean the contacts and not work. I change the rechargeable batteries for alkaline batteries and not work. I returned to original firmware and not work. Any suggestions? I filed off the protrusion on the leading edge of the male Cactus V6 II and the V6 now aligns perfectly with the locking pin and with all the contacts on my Olympus E-M1. Much more secure. Interestingly, it also aligns better with the plastic base plate that comes with the V6 II. In order to minimize metal filings, I put the Cactus in a plastic bag and then used masking tape to make sure that metal particles didn't end up in the hot shoe locking mechanism. The base plate is made of copper, so is a fairly simple fix. I have brought a V6 ii and just cannot get it to work on my E-M1 at all. I'm deeply disappointed as my other cactus products work well on my Olympus E-M1 and I've tried all the solutions suggested before this . Once you filled off this protrusion did everything work as expected , including HHS with your V6ii on your E-M1 ? Could you possibly post a picture of what you filled off to help as I'm not exactly sure what you filled off . It could help so many frustrated E-M1 owners ! Yes that would indeed be helpful to see what you did on yours, @Michael. @cliveholland, I am surprised to hear the V6 II still does not detect your E-M1 after taking off the metal spring. Could you confirm please? After mounting the V6 II on your E-M1, first switch on the camera, then switch to TX mode and at the same time, half press camera's shutter button a couples times - the idea is to keep the camera active so the V6 II can detect it via the various hot shoe contact pins. FYI, the new V6 II actually talks to the camera, but the original V6 does not - it only uses the central hot shoe pin for flash triggering. There might be a connection issue on the original V6 that you are unaware of as the other hot shoe pins are never used unless you use TTL Pass Through - mounting an Olympus TTL flash on your E-M1. To that note, we discovered that the E-M1's hot shoe is slightly different from its silbings. And by removing the hot shoe metal spring plate have solved the connection problem. Thank you in advance for troubleshooting and we look forward to resolving the issue on your E-M1. I can confirm that after taking off the hot shoe metal Spring that the V6ii did NOT detect the Olympus E-m1 camera , though the v6ii says it detects a Olympus camera .. But nothing with fire the speedlights and I've put the v6ii into both short and long range mode . Wow, that is brilliant. After all this time, I could never get the Olympus FL-50/50R flashes to work on my V6 with TTL pass through. After seeing this, I pulled the spring from the hot shoe and tried it again. Works just fine. Ran through a series of flash exposures at f/2, f/4, f/5.6. All exposures were proper and the same. Then mounted the V6ii . Then pressed the camera shutter half way and then turned the V6ii on into TX mode . NOW IT ALL WORKS PERFECTLY . The trick was removing the spring and then you must mount the v6ii and you must press the shutter halfway before turning it on into tx mode . Before I had only removed the spring . Try pressing the shutter halfway before turning the v6ii everyone and make sure you camera is turned on before doing so . It's worked for me and HHS works perfectly . After setting the V6 II to auto-detect (AUTO) from a manually selection camera system, you must restart the V6 II for the selection to take effect. This applies to both TX and RX mode. Half-pressing camera's shutter button is simply to keep the camera stay active as the V6 II carries out the detection process. Some cameras goes to sleep very quickly. Thank you again and let me know if you need further assistance. The problem I encounter when using my Em1 (with removed spring plate) and my em10 is that I get the off camera flash to fire but I can't alter the flashpower. I get to adjust the flashpower by turning the wheel dial on the v6ii (tx) mounted on my camera. What I mean by that is if I turn the dial on the tx, the v6ii in rx mode mounted on my flash (metz58 af-2) takes the same flashpower setting BUT the output when flashing remains unchanged. The flash does not fire with more or less power. It fires, but without change in power. Both the v6ii's are firmware 1.1.6. I bought two duo packs of v6ii's en none of them work. ...if I turn the dial on the tx, the v6ii in rx mode mounted on my flash (metz58 af-2) takes the same flashpower setting BUT the output when flashing remains unchanged. The flash does not fire with more or less power. It fires, but without change in power. Also, observe the distance between TX and RX units. Set the work range to SHORT if they are in close proximity, say between 10cm to 3 meters. First of all, thank you for the quick and helpful response. Thanks a million for the help! You can only activate TTL pass-through if on the on-camera V6II transmitter, the chosen camera system and the chosen flash system are the same. The TTL pass-through mode is intended for letting the camera communicate with a flash mounted on the on-camera V6II transmitter, as if the latter were not present. It allows you to use system-specific functions on your flash. However, don't expect TTL pass-through to work via radio. For off-camera flashes, the V6II is a purely manual trigger. @Class A: thanks for the detailed explanation. That clarifies it. I am perfectly happy with manual. The HSS works perfectly on my Em1 and thats most important for me! Hey no problem! Glad it is working now. Let us know if you need anything else. With the recent announcement on cross band support.it is not clear to me whether TTL will now work with off camera flash or is it still as outlined above. Wireless TTL will work, just not now. This is the plan, exact cross-brand TTL compatibility will be confirmed later as we progress with our study. FYI we are still working on the Sigma version, and will soon start Fujifilm. Olympus should be next on the list. Any news on when the Olympus TTL compatibility will be out. I heave checked the website and no change since 16th June. it looks like Pentax is lucky next and then Olympus, but I wondered if there was any idea of time frame please? Is the V6 not compatible with this arrangement? Is the power output of the FL-600R only delivering 1/128? Am I most likely missing a crucial set up step? Any help much appreciated as I am rapidly getting annoyed. Just a wild estimate, November 2017? Consider it takes us around two months to complete Pentax, which brings us to September. So October we start beta testing for Olympus and then it will be ready by the end of November. ...Is the V6 not compatible with this arrangement? A V6 (analogue TTL) cannot trigger a V6 II (digital TTL). The other way around is possible but only supports Power Sync. All the newer Olympus flashes, including the FL600R, runs purely on digital TTL protocols, so you will need it to mount on a V6 II. This you have done it right. You simply need to get a second V6 II unit as a transmitter and the problem your encountered will be fixed.